thinking about my new role as stay at home mom. I’ve always been the one who worked all day (teaching) and now I’m all of a sudden not the money maker, the worker, or the go-outside-the-house-and-do-things-er. I am reinventing my schedule, my perspective, my identity aside from a job. listening to a lot of Jesus Culture and Bethel, trying to add some new songs to my worship set lists. I love their hearts, their leading ladies and the versatility of their songs. Mmmm, so good. reading the Outlander series – specifically, I’m still in the first book. I had friends and family members who had read them ages ago, and have raved about them for years. Now that the tv series is coming out, I figured it was time. 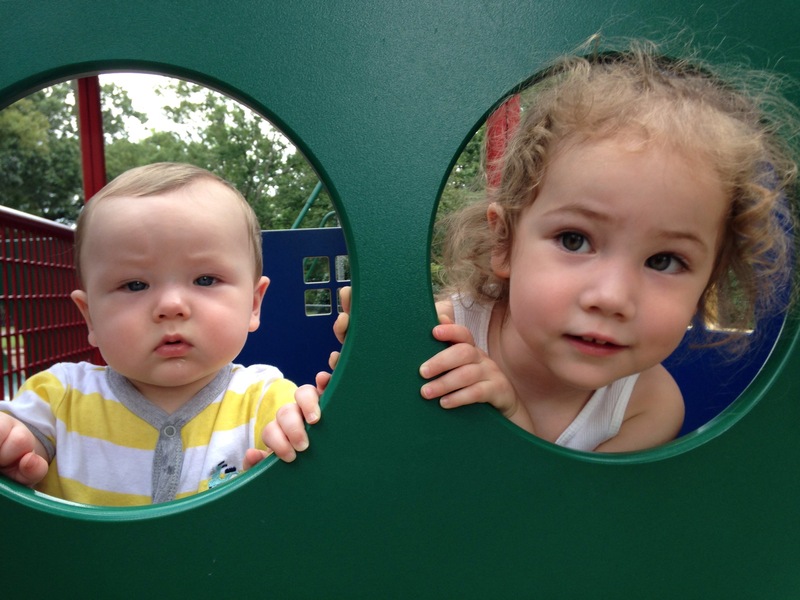 thankful for the stages of life that my kids are in. EK is becoming more and more independent (and curious and brave and insolent, haha) every day. J is really mommyfied (I think my mom coined this term, for me at least) but it’s actually sweet most of the time. photographing my kids, all day every day. Well, not that much. But they are easily the cutest thing I see all day, and they change so quickly, and do new cool things so often that I feel like I need to document it! There ya have it! Check out When At Home because I love it and you will, too. And while you’re here, tell me what you’re up to lately! 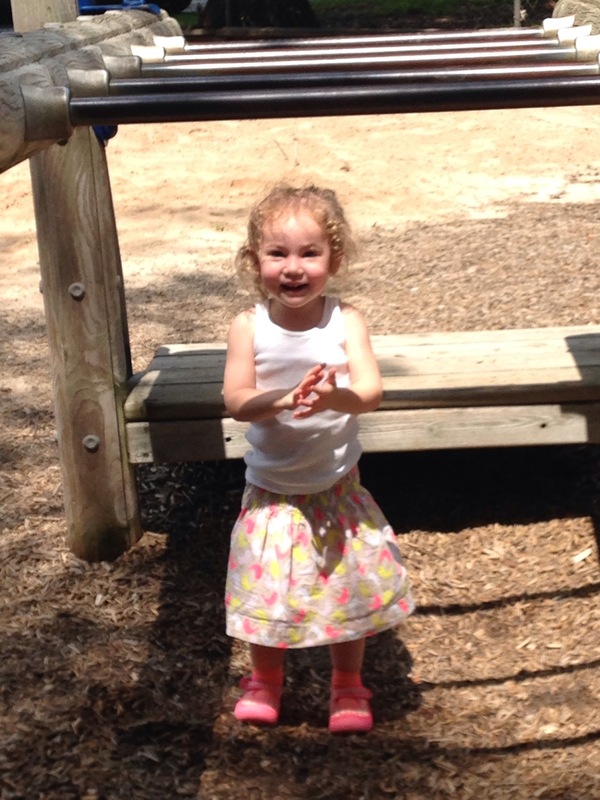 Recently we’ve been visiting the playground at EK’s preschool she’ll be attending in a couple of weeks. I can’t believe we’re already to the preschool stage, even if it is just two mornings a week. 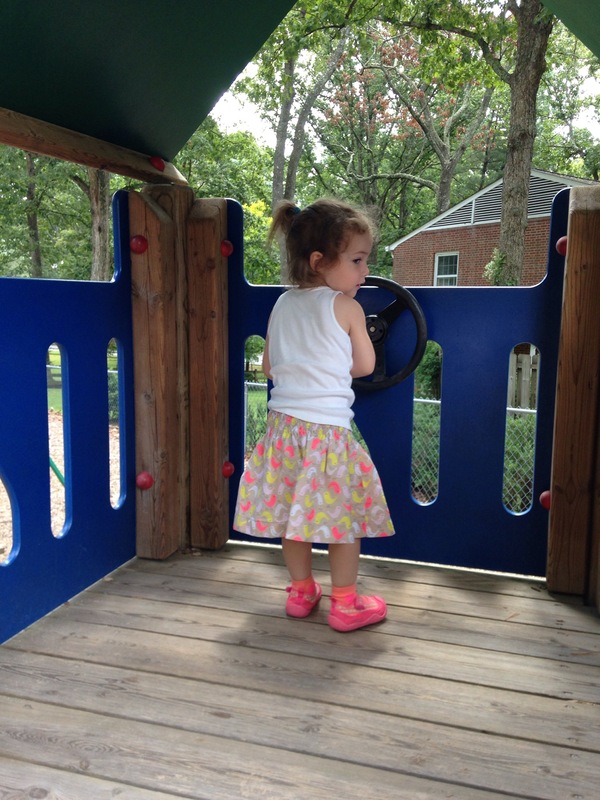 Almost everything on the playground is toddler-sized. If she fell off something, she’d be fine. 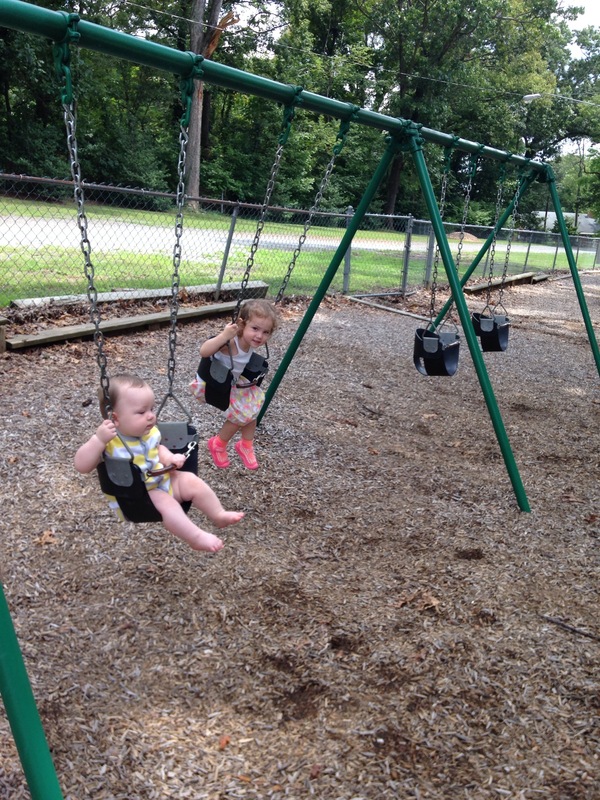 The swings have little belts, and the slides aren’t too tall. 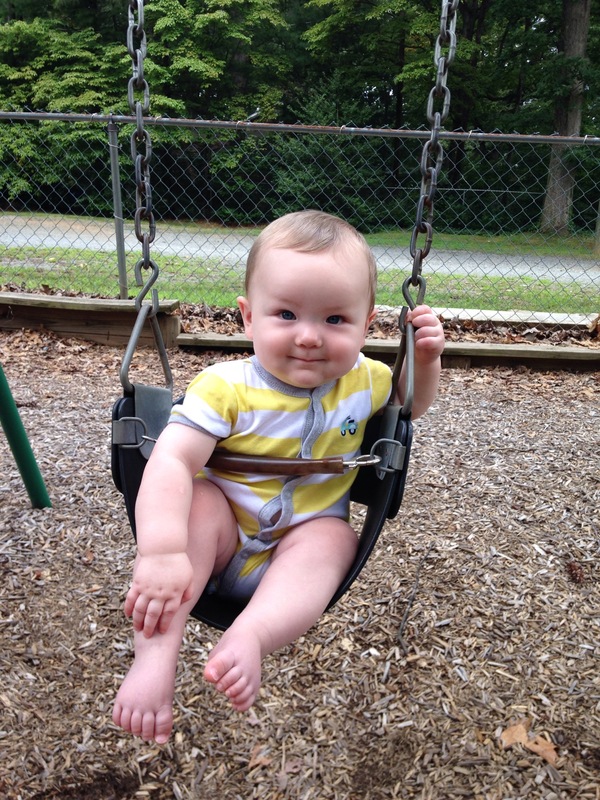 Don’t worry – I know that swing wouldn’t really hold him in, but I was standing right there. 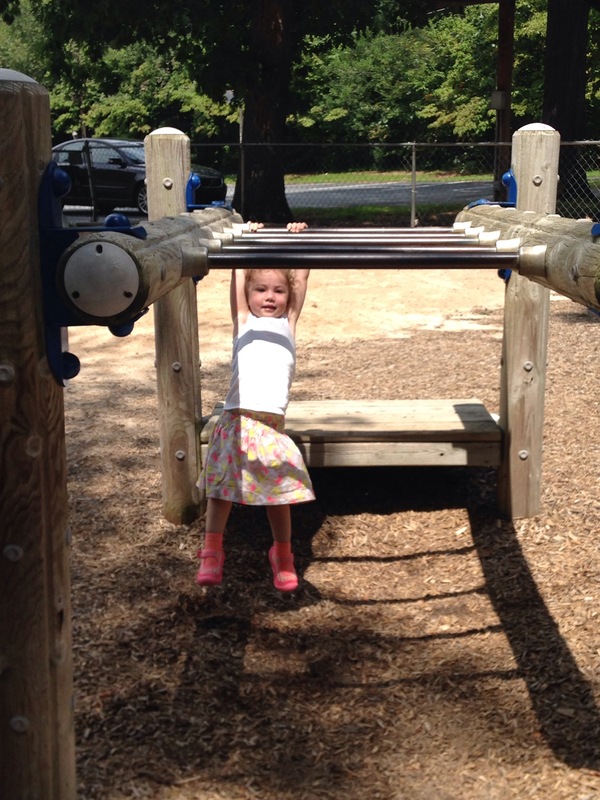 First time trying monkey bars! She only swung on this one bar, but she did it repeatedly! That’s an accomplished face on a big girl. Cue the tears from the mama. 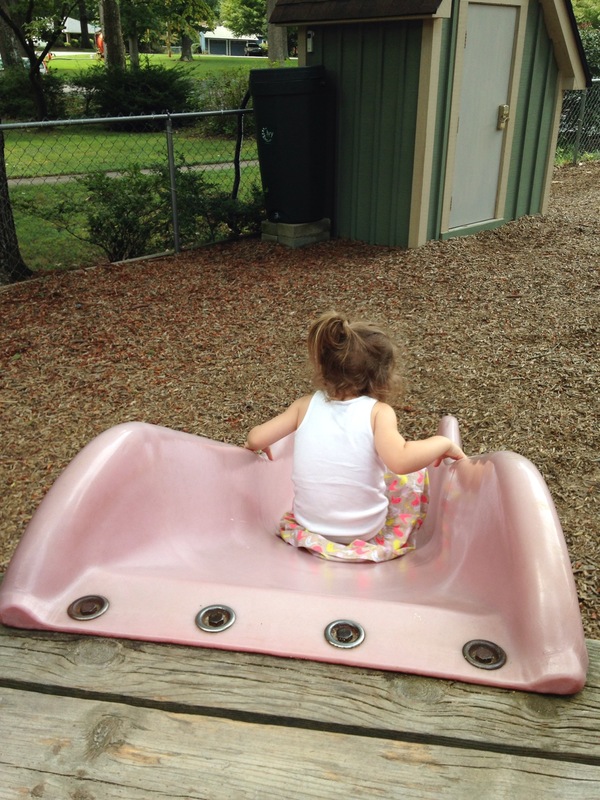 Is there a neat playground for smaller kids where you are? Hubby and I have said, ever since we started talking about kids, that we’d like to have them close together. There are two reasons. First of all, my brother and I are almost seven years apart, and we were never very close… at least not until we were both adults. We get along great now, but we were never in the same stage of life till we “grew up”. Secondly, Hubby grew up with two brothers, just a little over 3 years between the oldest and the youngest. They’ve always been best friends – shared everything, fought over everything, loved the same things, and disliked the same things. They knew each others strengths and weaknesses, successes and faults. Yet they had a strong bond. They still have do, and that bond has carried over into their wives and children as well (you know, once the kids have personalities and do their own things). Hubby (far right) and his brothers, circa 1988-ish. I just spent an evening recently, celebrating one of my sisters-in-law’s birthday, with the whole family (Hubby’s parents, his brothers, their wives and the offspring). The love that every person in the house had for every other person was amazing. We know each other well, know our nieces and nephews well, and we love each other well, too. But the most hilarious thing is to see the brothers interact. When they’re all together, they have a hilarious tendency to revert back into their eight, nine, and ten-year-old selves. They immediately start bragging about their Nintendo skills, talk about how they used to wrestle each other in the basement (roundhouse kick to the FACE! ), and possibly give a quick reenactment of one of their fights. Or, they lie on the floor, cuddling, like a bunch of puppies, maybe even with their kids. Sometimes I sit and think about how much love is in that pile of faces and limbs and laughs. Grown men or babies, love and a sense of belonging abounds. What a great image of the love of a Father, who knows us better than we know ourselves, who knows our thoughts before we think them, and loves us abundantly anyway. To be loved is important; to love others unconditionally is of even greater significance. So when I think about my children, I want to pile them up like puppies. 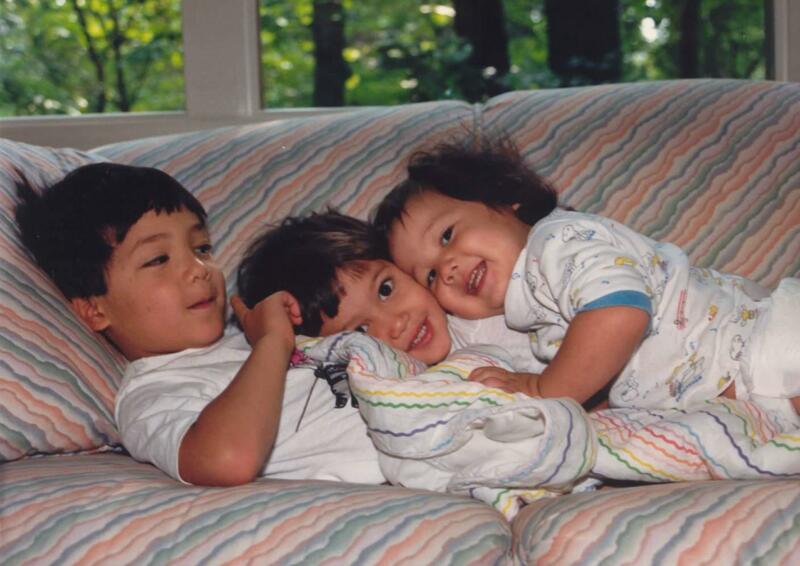 I want to them to have that sibling love inherently, to not really know life without their best friends. I want them to experience that love early, and first hand. Their siblings and cousins, because of their closeness, will know each other inside and out, and will know how to love through differences or difficulties. What better way to love and be loved? 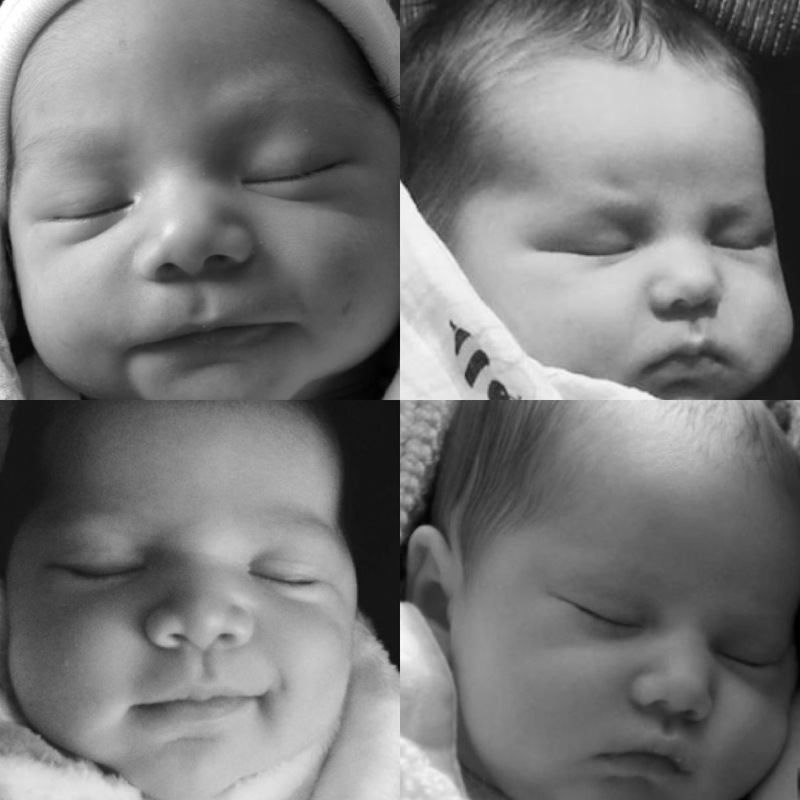 The four babies of the three aforementioned boys, less than one month in each picture. 1. He gets really dirty. When EK was not quite 8 months, she was never really dirty. She played a lot, but she had a nightly bath, and her hands and face were constantly being wiped. J usually gets a nightly bath, but that’s the first thing to go if we’re running late or having a rough night. And as far as wiping his hands and face go, he’s left to the mercy of time… either we have it, or we don’t. EK is always trying to feed him something, or hand him something from the ground that’s covered in dirt. Yikes. 2. He wears a lot of hand-me-downs. Don’t get me wrong – EK did also (they have a lot of cousins). 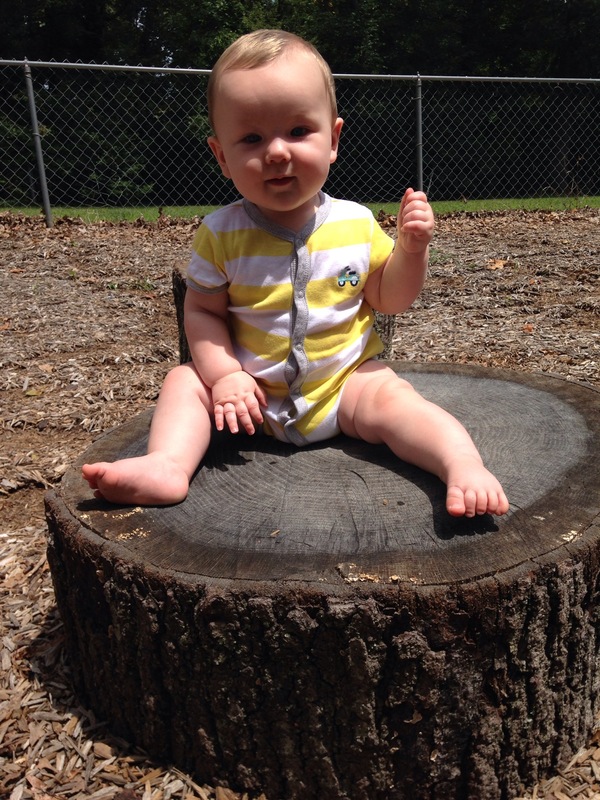 But most of her wardrobe was carefully selected before she was born, in lots of sizes, in sweet little outfits. J’s just wearing whatever I can toss on him before he starts rolling off the changing table. 3. He doesn’t get to play with many toys. EK isn’t a great sharer to begin with, but if it’s her stinky ol’ brother we’re asking her to share with? Well that’s totally unreasonable. Anything he has in his hand automatically becomes hers. And bless him, he doesn’t even cry about it. 4. He doesn’t get as much one-on-one time with Hubby and me. This is one we really try to keep to a minimum. We frequently take one kid each if we’re going separate places, so that each kid gets all the attention. But let’s face it – that first kid got all the attention (from everyone because she was the first grandchild on both sides, also) until J was born. 5. He rarely finishes a nap or night’s sleep. EK is loud. Really loud. And unless she is sleeping when he is waking up, he gets woken up by squeals, cries, or heavy-footed running by his bedroom door. What are some things you feel like you did for your first that you didn’t (or couldn’t!) with your second?